Presented by philanthropic group Feast It Forward and foodie haven Oxbow Public Market, the inaugural FEASTstock Festival aims to raise funds for Napa Valley Food Bank with a daylong party featuring gourmet food, local wines and craft brews, live music by North Bay bands like Dgiin, the Blind Barbers and Johnny Smith and family-friendly activities. 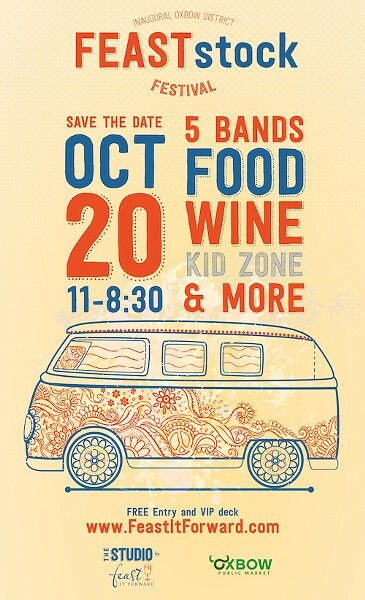 Oxbow Market vendors and chef Rick Moonen are providing the food, and a special VIP ticket will secure you a spot at the table on Saturday, Oct. 20, at Oxbow Market, 610 First St., Napa. 11am to 8:30pm. Free general admission. 707.226.6529.